Why do I need a new preamp? Well, I don't really. I have recently finished a full-function line preamp with remote control and a proper relay-switched attenuator. This has all the functionality I could ever want, including internal balanced topology, plenty of balanced and unbalanced inputs and outputs, a polarity inversion switch and mono option, and the system is sounding very colourful and dynamic right now and satisfying with most sources. However, there is a slight glaze to the sound from LPs which can leave me feeling tense, and I'm missing the body and beauty of sound which I know the vinyl medium is capable of. This isn't due to any problem with my (pretty decent) turntable system, as I check the setup regularly and this aspect of the sound was already noticeable with my previous cartridge. I used to use (and still own) the excellent Croft Super Micro A valve preamp, and found its immediacy and colour from vinyl entrancing, though the transparency of its line stage is easily beaten by my solid-state preamp. The Croft was moved out of my system a few years ago when I moved up to low-output moving-coil cartridges, as it doesn't have enough gain for these. This pointed the finger at my venerable Ben Duncan-designed ADEQ phono stage, which I built ten or more years ago from PCBs supplied by Audio Synthesis. After much contemplation I came to the conclusion that what I really wanted was a valve-based phono stage. I had been thinking of building a valve preamp of my own for many years, and even bought various power supply bits in anticipation, although until now I hadn't actually built anything. I did a fair bit of reading on the Web, and decided that for the greatest flexibility in cartridge choice what I needed was a phono stage with a hybrid front end, so it would have enough gain and low enough noise to work with low-output moving-coil cartridges. I studied various circuits and articles extensively, and particularly liked what I read about the Audio Research hybrid preamps, especially the complex and sophisticated SP-11. When I used to attend Hi-Fi shows regularly a few years ago I always enjoyed listening to systems with Audio Research electronics, particularly one I remember with the similar (though simpler) SP-14 and one of the larger Classic power amps. On Manfred Persson's amazing ARC homage site I discovered an (almost) complete description of the SP-11, including complete schematics and detailed photos of the PCB and enclosures. I started making plans until I had actually reached the stage where I was ready to start buying parts to build a clone of the SP-11. Around that time, though, I found the Vacuum State Electronics website and Allen Wright's extensive discourses, and started to have doubts about the SP-11 architecture, which - despite its excellent engineering and clever hybrid amplification blocks - still has the same basic circuit topology as the original all-valve SP-3 from 1973. Allen is insistent (see his article on phono stage design) that two of the keystones of the Audio Research approach - global feedback and series regulation of the B+ rails - colour the sound unacceptably. I am receptive to this viewpoint; the circuit design of Allen's preamps seems to be well thought out and is seductively simple, and the RTP3 offered the potential to better the SP-11. This is Allen Wright's constantly evolving top preamp, and is very similar in conception to his FVP5 though the latter is single-ended where the RTP is fully differential. Allen was inspired to use of differential cascode circuitry from working on 1950s Tektronics and Hewlett Packard valve oscilloscopes, where it allowed high linearity and a bandwidth up to hundreds of megaherz, without any loop feedback. The output of the line stage is the complex (though still less so than one of the SP-11's gain blocks!) Super Linear Cathode Follower, which uses a current source and a bootstrap arrangement to ensure both constant voltage and constant current operation of the output valve. There are liberal sprinklings of silicon devices in the circuitry, mainly in the power supply and regulation, but notably in the input stage of the phono circuit: for high-output cartridges the original inpur stage used a matched pair of 2SK170 low-noise JFETs, but Allen now recommends the monolithic matched bipolar devices MAT-02 or SSM2210. The current RTP3D, which is probably similar in most respects to the RTP3C circuit shown above, is a genuine overkill design, with every detail attended to. For instance, there are six separate current-regulated filament supplies for each channel, referenced to three different DC voltages, as well as several discrete current sinks for cathodes. 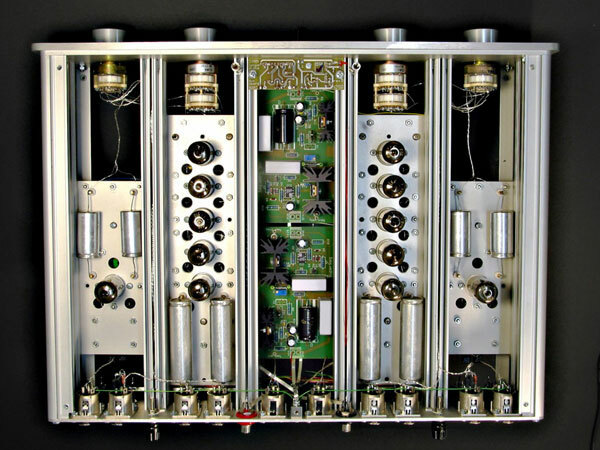 There are six E88CC/6922 valves per channel, adding to the cost (funnily enough, there are the same number of valves in the signal circuits of the Audio Research SP-10, and this was a major reason for preferring the SP-11 as a clone project!). It has a high reputation for sound quality, particularly for its transparency, dynamics and soundstaging. With its hybrid input stage and overall low noise, the phono circuit is suitable for the moving coil cartridges I use. I like differential circuitry - my own solid-state preamp is balanced almost throughout, and true differential operation takes things even further. Finally, although the valves are run at quite a high current (6-14mA) the combination of cascode operation, which reduces the voltage across the valves, and the elevated filament supplies should increase the valve lifetime considerably. This is to be contrasted with many commercial preamps (the ARC SP-10 and SP-11, for example) which run the valves close to their maximum voltage ratings, and have a reputation for needing frequent valve replacement. As with all Allen's designs, the RTP3 is available from Vacuum State Electronics ready-made or as a complete kit. Both of these options are very expensive, and, as I like a challenge, I am building the RTP3 from circuits and articles published on his web site and photos of built RTP3s. Allen is insistent that shunt regulation is sonically far superior to the much more widespread series regulation favoured by Audio Research and others. I'm not sure that I am convinced by Allen's explanation of the advantages of shunt regulators (that they can sink as well as source current from the load), and I do find series regulation more appealing in principle, but I certainly like the idea of the isolation that the current-sourced shunt regulator gives from the mains supply. Allen is also very definite that he doesn't like to use electrolytic capacitor bypasses on his B+ lines, so I am also a little surprised, looking at the SuperReg schematics in his Tube Preamp Cookbook, to see a large electrolytic across the output of the regulator. Following Allen's design concept thoughout, though, I am feeding each channel's high-voltage B+ line through a shunt regulator, which will sit in the middle of the main preamp box, as in the production RTP3. These aren't Allen's own SuperReg, however, since the PCB details and full construction guide for this are (understandably) only available with his own kits, but the similar - and comprehensively documented - HPHV shunt regulator designed by Emile Sprenger (who is also an RTP3 builder!). The total current draw of each channel of the RTP3 I calculate to be somewhere between 55 and 60mA, and should be pretty constant since the circuit is differential. With phono stages which use feedback to do the RIAA equalisation, like the ones in the various Audio Research preamps, or those that do it in two stages separated by a buffer, it is usually clear on inspection how the equalisation works. With the RTP3, however, the RIAA equalisation is passive and done all in one stage, so it's not immediately obvious how all of the time constants are derived. The 318us is clearly made up from 4K22 and 75nF, and 150R and 24n68 make something close to 3.18 us (although this last is not as critical as the others). To get the 75us and 3180us time constants, we need the source impedance (25K) in series with various combinations of the other resistors, including the anode resistors and the volume pots. These are horribly interactive, so there is no combination which is identical to either. Basically the 24nF capacitor in series with the 150R resistor and all the other resistors in parallel comes out at 95us (somewhat over 75us), while the 75nF capacitor in series with the 4K2 resistor and all the other resistors apart from the 150R gives 2660us (a bit under 3180us). I haven't been able to get hold of the the venerable original Lipshitz article Allen mentions, but I went through the algebra myself, and got these results (which are actually slightly different from the ones Allen quotes in his Cookbook) for a simpler, idealised network without the 4.7uF coupling cap. To check everything out, I put the component values given on Allen's RTP3 circuit into a simple FORTRAN (yes, I know...) program and simulated the RIAA response of the phono stage. I included all the components up to the volume control, and assumed that the output impedance of each valve is equal to its 25K anode resistor. You can see the results in the plot on the right: the blue trace is the target RIAA response, including the 3.18us time constant, the black one is the simulated response, and the red curve is the error. The start of the low-frequency rolloff from the 0.47u capacitor (-3dB at 7.1Hz) is just visible in the black curve. The figure shows each curve relative to 1kHz, so the error is by construction zero there, but we are more interested in the variations from the mean over the audio range. The predicted error is then less than +-0.6dB or so between 20Hz and 20kHz, which is pretty good, though not quite as good as the 0.1dB claimed in the RTP3D brochure. Playing around with the coupling cap and the "LF tuning" resistor in parallel with the two RC networks I could get the low-frequency error down by a factor of three. All the same, the simulated response is encouraging. I would expect that wiring capacitances and other parasitics, as well as any depature of the output impedance of the gain stage from the nominal 25K, would change the result slightly. I would expect that Allen has tuned the values so that the phono equalisation is more accurate than my modelled one in at least his practical realisation of the circuit. Being able to reproduce this, of course, assumes that the circuit is built identically to Allen's, and he indeed recommends final tuning for perfection. I used Rg=15K, giving a gain of about 10dB. Comparative review including the RTP3D (which came top of an illustrious group!) on Positive Feedback Online. Jack Roberts's review of the RTP3D on the DAGOGO site. Report on the RTP3C by one of the "beta-testers"
Review of the FVP5 on the TNT-Audio site. The FVP5 in another group preamp review on Positive Feedback. Jack Roberts again, this time on the SVP-1 (formerly the FVP5) on DAGOGO. Roy Gregory's HiFi+ review of the SVP-2. Pat Kennedy's review of the RTP3D on the Six Moons review site. A review of VSE's modified Sony SACD players, as heard in Allen's own system (including an RTP3D) in Switzerland. Allen's brief comments on the input stage of the FVP5. A brief discussion on a DIY design similar to the FVP5. Some Pictures of an RTP3C built for a VSE customer. Some great close-up photos of Emile Sprenger's RTP3C. The shunt regulator boards in this preamp appear to be an earlier version of Emile's own HPHV, and not the SuperReg. A translated article on a Swedish site that discusses a visit to VSE in Switzerland. Some more nice pictures of the RTP3D! A discussion of the RTP3 on the DIYAudio forum with some pictures of Sylvain Bergeron's excellent RTP3 project. John Broskie's differential phono stage. Jim Hagerman's Calculator for choke input power supplies (this doesn't work on a Mac, unfortunately, so I've never been able to check it out!). Nelson Pass's article on cascode operation; some impressive distortion figures for a circuit rather like a SLCF. Mark Kelly's article on valve heater supplies. Part 2: building the RTP3: how does it sound?